OH BOY. 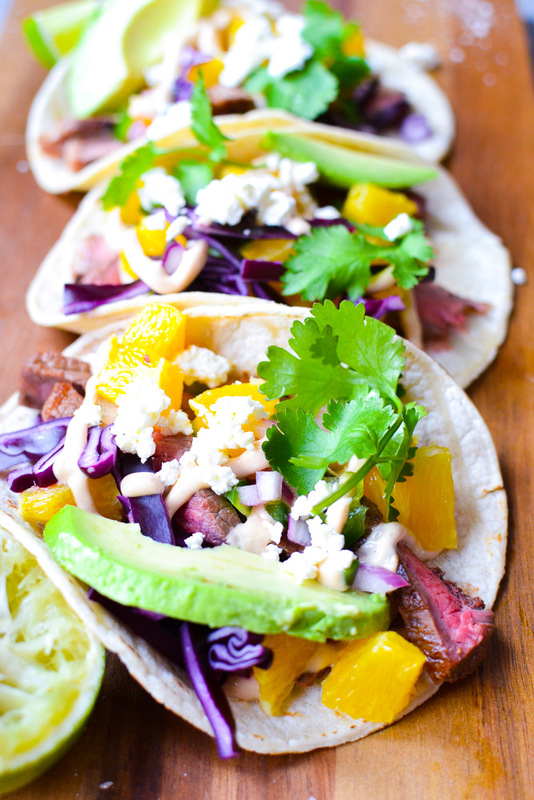 30 minute steak tacos with orange jalapeno salsa. Yes, it tastes as good as it sounds and looks. Not going to lie, I had a hard time picking out a name for this recipe. See, it also has a chipotle lime mayo, the steak is marinated and there’s a few other toppings. Namely, feta cheese, cilantro and avocado. 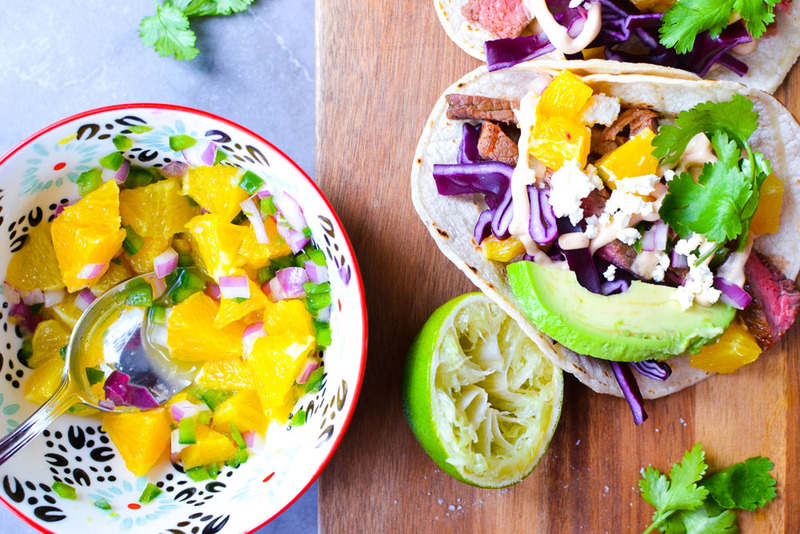 But adding all that would have made for a very long title…oh well, I can at least ensure you that these tacos have tons of flavour. I am a huge fan of mexican style cooking. Tacos, enchiladas, huevos rancheros, mexican street corn…I could keep going. But the great thing about tacos is how fast they come together and how easy and flavourful they are. The steaks are marinated for 20 minutes, but if you’ve got lots of time they can be marinated up to 4 hours, or even overnight. There may seem like a lot of ingredients, but some of the toppings are optional. I wouldn’t skip the feta though, it’s soo good. Also, we used striploin steaks, but if you use a cheaper steak, we recommend marinated for at least 4 hours. 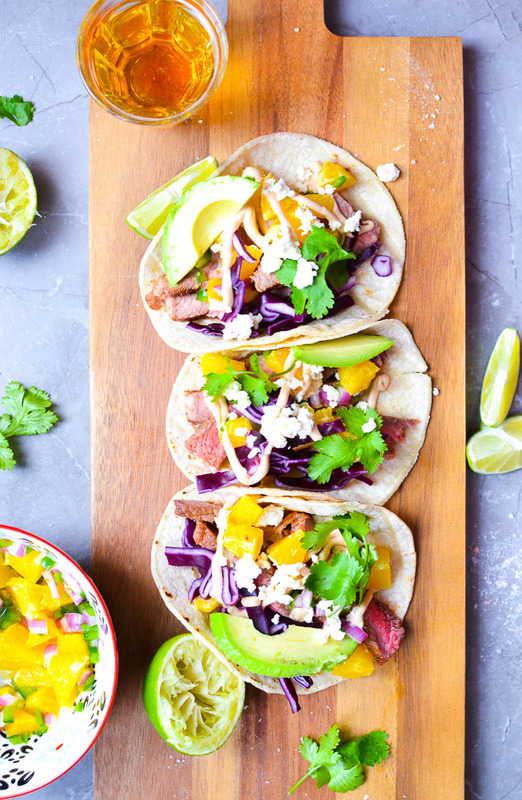 A fast and delicious taco recipe you can have ready in 30 minutes. Mix together the marinade ingredients and pour over steak. Flipping steaks to ensure marinade gets on both sides. 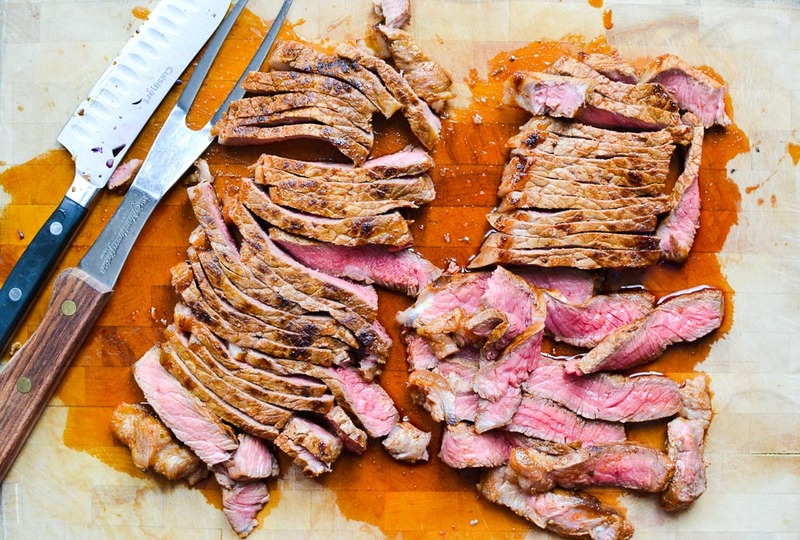 Set aside for 20 minutes, flipping steaks midway through. 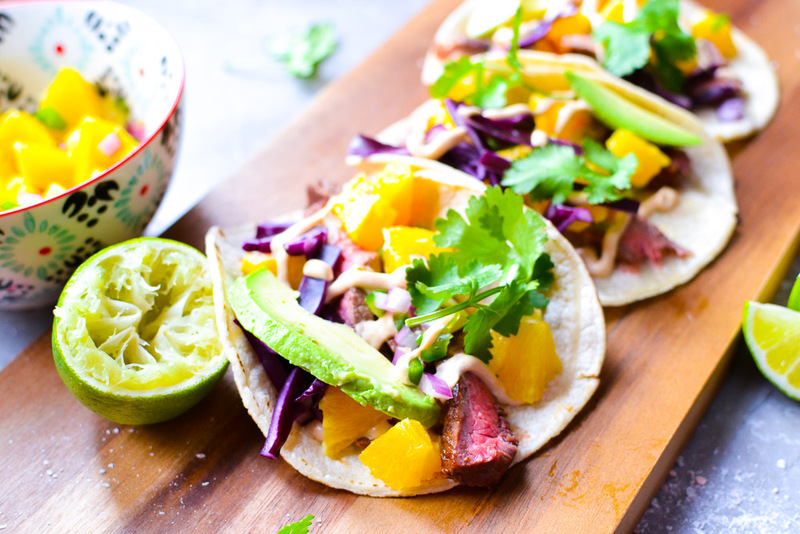 While steak is marinading, prepare salsa by mixing lime juice with honey, then adding the oranges, onion and jalapeno. Mix together ingredients for chipotle mayo and prepare toppings. Heat oil in a cast iron pan or non stick pan over med heat. Add steaks and fry for 4 minutes on each side, or to preference. Remove to a cutting board and let rest for a few minutes, then slice into strips. 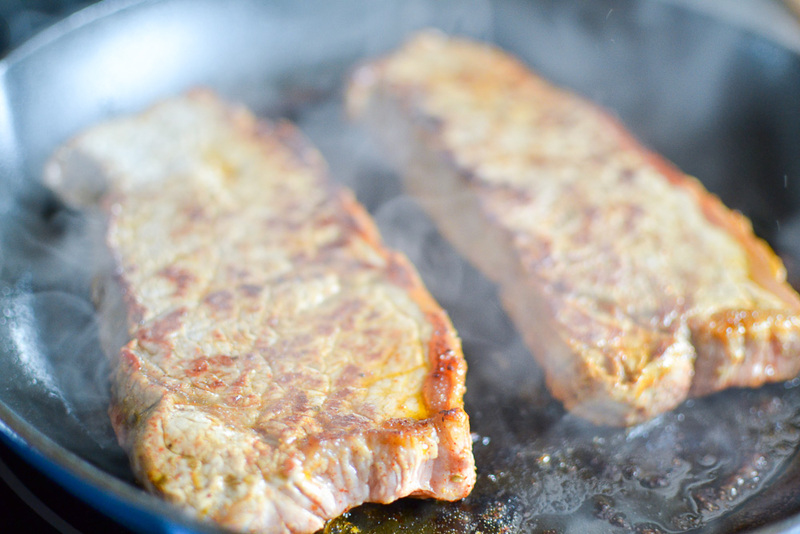 While steak is resting, heat another pan over medium high heat to warm and slightly brown your corn tortillas. Flip and do the other side. Remove to a plate and cover with a towel to keep warm. To assemble, place two corn tortillas on a plate, top with steak, salsa, chipotle mayo, cabbage, feta and any other toppings you desire. Enjoy!